"SEALTECTOR ATV BOWCASE # 20580"
"Rear Sealtector Case # 20635"
Kolpin has done it again, this time with a Bow case for the ATV enthusiast.The Sealtector ATV bowcase is the first case of its kind that I am aware of. 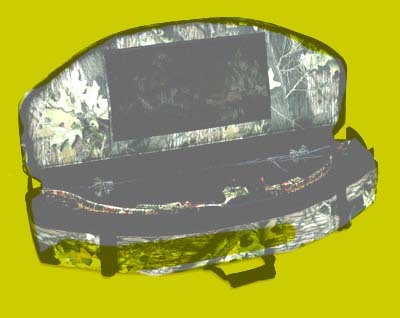 It is heavily padded for protecting a valuable investment and it also has a huge storage space under the bow storage compartment.The Sealtector ATV Bow Case is seccurly attached with velcro straps and quick buckles.It has numerous compartments both in the top bow compartment and in the bottom partitioned storage compartment.There are several mesh see thru pockets inside for releases and smaller items that are usualy hard to find.The outside has a bungee system on the top to secure other items like a spare camo suit, boots etc.This case also comes with a suitcase type handle and a removable shoulder strap It is waterproof and mud proof ,with good heavy zipper closures.The bow is held down on an elevated padded platform with velcro straps.This platform lifts up to access the bottom section which is full size, padded and partitioned. The ATV Rear Sealtector case is not a bow case , it is a storage case/suitcase that secures to the quad with the same velcro, quick buckle attachments as the Bow case does.This case is also heavily padded to protect valuables and it is lined with a foil type material that also reminds me of a cooler.On hot days it will keep a lunch and drinks cool as well as dry and clean.The rear sealtector also has a suitcase handle and a shoulder strap for easy carrying into camp or home. These cases are able to be mounted to the ATV in about a minute each.The main straps are attached to the racks by looping them around the bars and then they are pulled tight at the quick buckles.There are no holes, to drill, or bolts to tighten.To remove the case just squeeze the side of the quick buckle and it's off.the straps can stay attached to the rack for the next use. We sent out my brother Doug with the sealtector ATV cases loaded with his bow and all the accessories that would be used on a hunting trip to see just how well it would perform.The terrain was mixed, with mud bogs, creeks and open fields , woodland trails and farm access dirt roads.The quad that we used to test the cases with was a Yamaha 500cc Grizzly.It was a trip to see just how well these cases would do when hunting season arrived. Initialy the going was easy and frequent stops to check the contents proved that all was well and there was no reason to worry.Speeds were increased to 60 MPH + over farm roads and fields, the easy going was over.If the cases were to be any good they had to prove it now,and they did.Creeks and mud bogs were tackled and mud flew from all 4 wheels digging their way out.The stops and checks again proved that nothing was moving around.The cases remained secure and never loosened.Inside the bow was still tightly secured .It had not moved.The bottom contents were all in their respective places with nothing damaged or moved. We also had the oportunity to test these cases after an early summer snow storm that made four wheeling a real challenge.Gumbo mud caked everything and by the time we returned home it had hardened and was caked on.The quad and cases looked like something that had been salvaged from the bottom of a mud pit.Cleaning was looking like it was going to be a chore,and we wanted to see just how well the bow survived its ordeal.Everything was dry and clean.Neither water nor mud had found its way inside.The Sealtector ATV Bow Case had come thru with flying colors. Cleanup was a simple operation.If these cases were to be of use they had to be able to withstand the same treatment the Quad received.The pressure wash was the tool of choice for this task.It would also be the final torture test to determine waterproofing.and durability.Both cases cleaned up under the high pressure jet and remained dry inside.This is far more abuse than mother mature would ever dish out.Other than a prolonged submerging I don't think we could test the effectiveness of these cases any better.They provided a quiet water and mud proof enviornment for both bow and gear .The GPS and Cell Phones as well as the bow remained dry and fully operational in the Bow case and spare dry clothing in the rear case was kept dry as well as our lunches. A feature that is well worth mentioning is that these cases are quiet.Unlike a hard case that bangs againts the racks, and clunks as things are bounced around the inside of these cases are padded.There is also a hard partition that provides a strong barrier under the padding unliks a typical soft case.This is the best of both worlds. I do not think there is a better hunting setup than these cases.They performed better than we ever expected and are now a permenent fixture on Dougs Quad.